Car enthusiasts from around the Rio Grande Valley put the pedal to the metal and made their way to the ninth annual McAllen International CarFest. It all took place at the McAllen Convention Center, throughout the main building and parking lot. 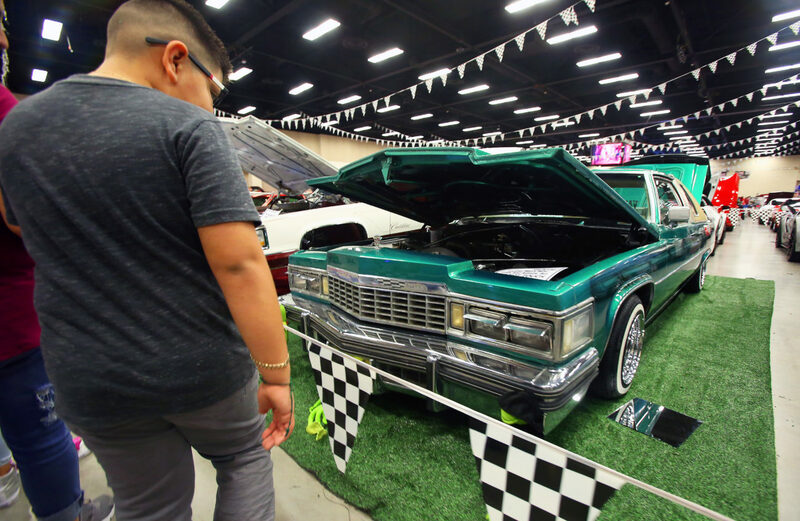 The event is considered the largest car show in South Texas and featured over 60 different categories of vehicles ranging from classic, antique, muscle cars, race cars and late-model vehicles. A large American flag greeted thousands of families as they walked slowly, taking selfies in front of the one-of-a kind vehicles. Each car sparkling, illuminated by the hall’s bright lights. One of the biggest draws at the car show was a replica of the Batmobile “Tumbler” as seen in the popular Batman Dark Knight Trilogy feature films. Families stood patiently in line to be photographed in front of the massive 22’ by 10’ shiny black vehicle. The car features spoilers throughout the vehicle and sports large 42-inch rear tires. Tex Reece built the Batmobile and traveled from Orlando, Florida to display the vehicle at the CarFest. He described the effort it took to build the futuristic looking car. Seven-year-old D.J. Rodriguez marveled at the Batmobile along with dozens of other children at the CarFest. He was there with his parents. According to Reece, the Tumbler replica is for sale at a whopping $750,000. Nearby, Sullivan City residents Jesus Perales and Baleria Valle gazed at a 1931 hot rod. Both said they were intrigued by the classic beauty. Other nearby classic cars towered over the relatively small ‘31 hot rod. Valle says the car’s small size wouldn’t stop her from taking a ride in the souped up roadster. “I’m kind of small so I would fit just fine,” Valle said. Both agreed that being seen in a classic car around the streets of Sullivan City would be a treat they would long remember. “That would be pretty unique, because no one has a car like this,” Valle said. Each year, McAllen city officials spend months preparing for the International CarFest. McAllen Convention Facilities spokesperson Stephanie Ramirez said attendance keeps growing each year the CarFest is held. The car show is also a way for McAllen officials to give back to the community. According to Ramirez, each year a local charity receives a large donation from the funds generated at the McAllen International CarFest. A number of activities have been added to the event, including an off-road extreme 4×4 obstacle course and a barbeque cook-off. The outdoor venue also featured carnival rides and several food vendors. Despite the recent end to the partial government shutdown, all previously furloughed federal government employees received free admission to the CarFest, Friday. All that was needed was a government-issued I.D.